Cisco is a big believer in the growth of mobile video, expecting it to grow from 33 petabytes a month in 2008 to 2,184 petabytes (or 2 exabytes) a month in 2013, which represents a 131 percent compound annual growth rate. (No wonder it bought the maker of the Flip video camera). As impressive as those numbers sound, at that point, mobile data will only make up 4 percent of total IP traffic. (Good thing Apple finally decided to get with the program and add video to its upcoming iPhone 3GS). 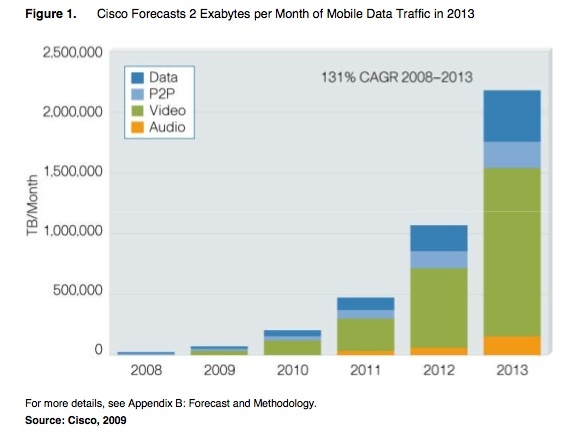 In the chart below, you can see how big a role Cisco expects video to play in mobile data traffic. Video is the green part of the bar graphs. Standalone data (dark blue) is also expected to grow quickly. 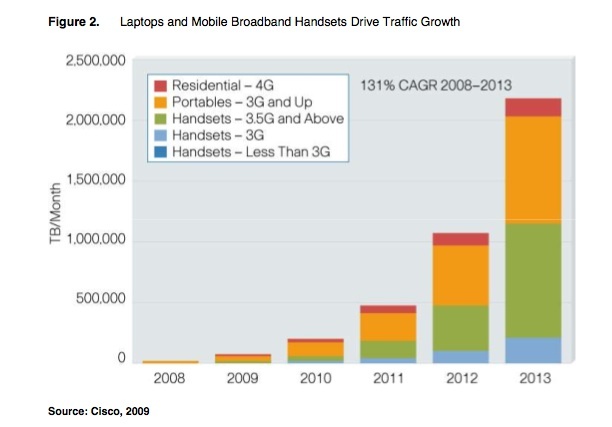 The devices expected to drive this 131 percent annual growth in mobile data are not so much current 3G mobile handsets, but next-gen “3.5G and above” (in green), as well as laptops and other portable computers (in orange). By 2013, I bet it will be pretty hard to tell the difference between those two segments. Until then, Cisco is offering free apps for the iPhone and Blackberry that lets you check your network speed on the go.